A childhood memoir from Hamdy: Sparring with words, a teacher, and extremism. 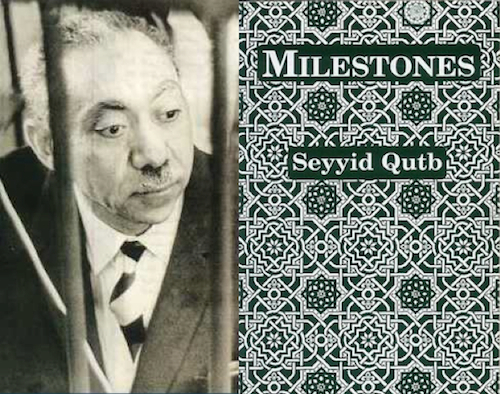 Recently, I re-read Sayyid Qutb’s Ma’alim fi al-Tariq (Milestones), and remembered the first time I ever saw this book. It was with Brother Hassan. For nearly thirty years Brother Hassan and a visitor, who would come to our town from afar, discussed those “Milestones.” Both men were sharp, high-pitched, and differed in their arguments. From Asr (Afternoon) Prayer until Maghreb (Sunset) Prayer they’d disagree and spar with their words. In the end, Brother Hassan ended the argument to his benefit. Bother Hassan worked in Cairo, but he lived in our town and took advantage of his nights and holidays to be an advocate for us. When we were children and teens, he used to teach us the rules of Qur’an elocution, and some of the Prophet’s sayings. He conducted his lessons in Sidi Semsam mosque reluctantly, since the mosque enclosed the grave of a Sufi man. Of course we were sure that on the night of the big Mawlid celebration he wanted to keep us away from it entirely so that we couldn’t participate in the festival with idolatrous thoughts in us. Brother Hassan also helped us memorize school lessons, lent us religious books, and gave the town the alms he collected. During summer vacation he accompanied us, along with some of the town’s Brothers, to the Mokattam or Saqqara deserts for a full-day hike of reciting passages from the Qur’an, singing songs, and playing soccer. Those hikes were delightful for poor children from average families like ours. And Brother Hassan, who was fanatic about Sayyid Qutb, occasionally organized evenings for us to watch documentary films. On one of those evenings he showed us a film about the Sabra and Shatila massacre and another one about the destruction of Hama from Hafiz Al-Assad forces, before changing the mood with a funny film about wrestling dwarfs. Brother Hassan used to bring me close to him and give me special guidance and advice so that I might become a better Muslim. In addition, he never had a problem with my presence during a discussion with one of the other Brothers, since he already knew my grandfather and my mother. My relation with Brother Hassan was close and friendly until the day of an argument. That day, a young man about his age came to him; though he didn’t look like a “brother in God,” because his beard was very long, and he wore a robe and a white Gulf Ghutrah on his head. Sheikh Hassan was wearing a shirt and trousers, and he didn’t have a beard, only a short black mustache. The visiting young man talked to Brother Hassan about Sayyid Qutb for a long time until they got in-synch and were in a good and happy mood, exchanging praise of Sayyif Qtub with his visitor . I was a teenager when I felt that I had been deceived and betrayed, and that Sheikh Hassan had thrown me from the reign of a heavenly sky down to an earthly hell. One Comment on "Brother Hassan and Sheikh Sayyid Qutb"